All transactions are safe and secure with a reliable history in online purchasing behind each of our associates. 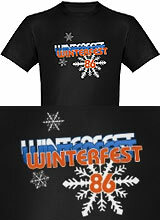 Buy the Winterfest '86 t-shirt to own Hot Tub Time Machine clothing and merchandise. Winterfest '86 at Silver Peaks Lodge in Kodiak Valley may have been a blast the first time around with Poison rocking everyone's world, but Nick made it even better the second time. Not only did he wail out to "Jessie's Girl", he sparked his career in the music business by giving the audience a sneak peek into the future with "Let's Get it Started". This Winterfest 86 shirt is available in a variety of styles and colors, so pick your favorite and get jamming with the Hot Tub Time Machine soundtrack. Put on your Motley Lue t-shirt, grab a can of the Russian Chernobly energy drink and get the party started. In addition to the Winterfest '86 tee above, browse the Hot Tub Time Machine Clothing Gallery for more apparel like men's and women's clothes, kids shirts or hoodies.